Section 13 has been REPEALED! 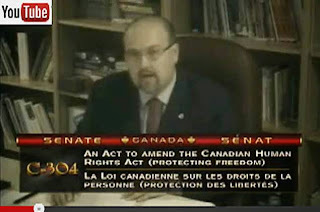 Yesterday, the Senate of Canada passed Conservative MP’s Private Members Bill - Bill C-304, which repeals the notorious censorship provision, Section 13 of the Canadian “Human Rights” Act. Late last night, the Bill became law and received Royal Assent. As of today, there will never be a new Section 13 complaint ever again! The outstanding Section 13 cases have just won a huge battle, but the war is not yet over. Section 13 makes it an offence to "likely" "expose" privileged groups to "hatred and/or contempt." There are NO defences under Section 13! Even truth and intent are considered irrelevant to a finding of discrimination. The law was enacted in 1977 in order to silence a man named John Ross Taylor for messages he recorded onto his telephone answering machine. In the intervening 32 years, not a single person who has been hauled up on Section 13 charges has ever been acquitted - a 100% conviction rate. Section 13 has been used and abused since its inception. Several people testified on June 25, 2013 before the Standing Senate Committee on Human Rights. Most of the testimony was nauseating and not worth spending a second watching. But there were two stand outs, which are worth watching. First is the presentation by Cara Zwibel of the Canadian Civil Liberties Association. 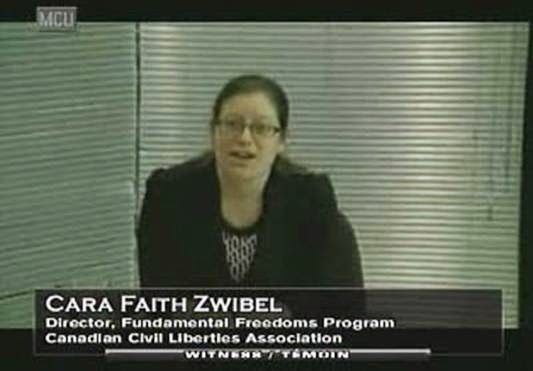 The CCLA supports a repeal of Section 13 and Cara Zwibel testifies about freedom of expression and why it is so important in Canada. June 25, 2013: Cara Zwibel of the Canadian Civil Liberties Association testifies before the Standing Senate Committee on Human Rights on Bill C-304 (to repeal the censorship provision Section 13 of the "human rights" Act). The CCLA supports a repeal of Section 13 and Cara Zwibel testifies about freedom of expression and why it is so important in Canada. 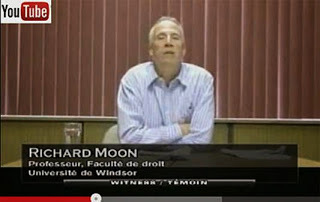 The second is a very short clip of Professor Richard Moon talking about Mark Steyn and the Macleans case. His comments on Mark Steyn and linking him to Anders Breivik are something else. 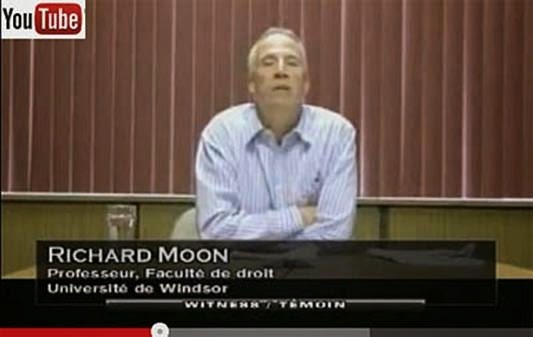 Readers might remember Richard Moon as the CHRC’s hand-picked “expert” on Section 13 who submitted a report which called for a repeal of Section 13 (then he disappeared with his $50,000 cheque). Of course the CHRC immediately dumped his report and pulled a “mulligan” to produce a report that said exactly what they wanted. 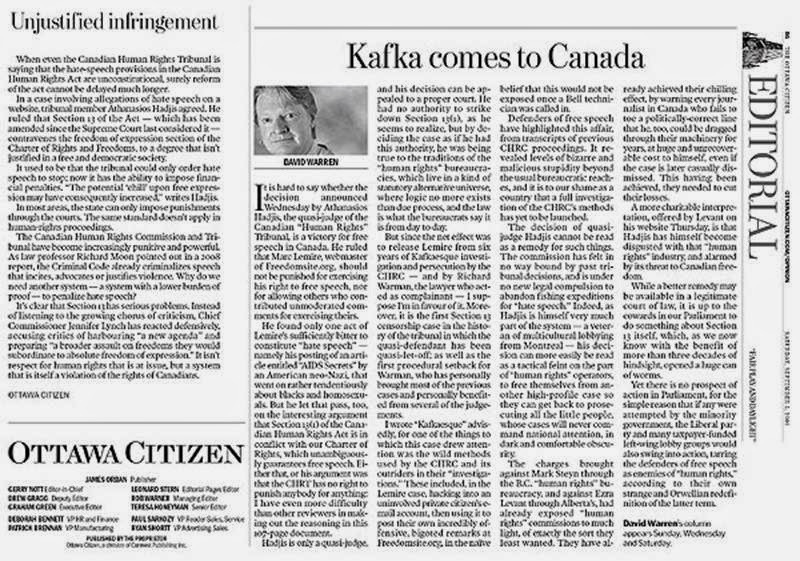 OTTAWA - An Alberta MP has succeeded in his bid to repeal a section of the Canadian Human Rights Act long seen by free-speech advocates as a tool to squelch dissenting opinions. 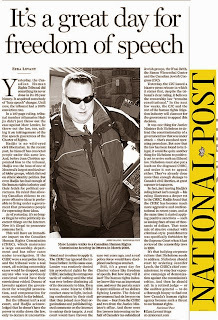 Conservative MP Brian Storseth saw the Senate give third and final reading late Wednesday to his Bill C-304 which repeals Section 13 of the Human Rights Act, an act that had been used to, among other things, attack the writings of Sun News Network's Ezra Levant and Maclean's columnist Mark Steyn. 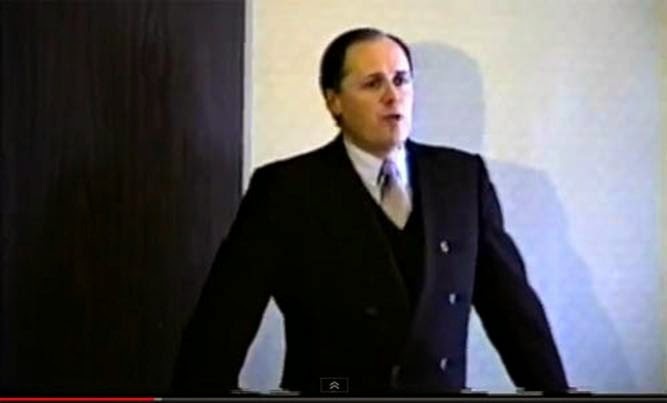 Section 13 ostensibly banned hate speech on the Internet and left it up to the quasi-judicial human rights commission to determine what qualified as "hate speech." But, unlike a court, there was no presumption of innocence of those accused of hate speech by the commission. Instead, those accused had to prove their innocence. 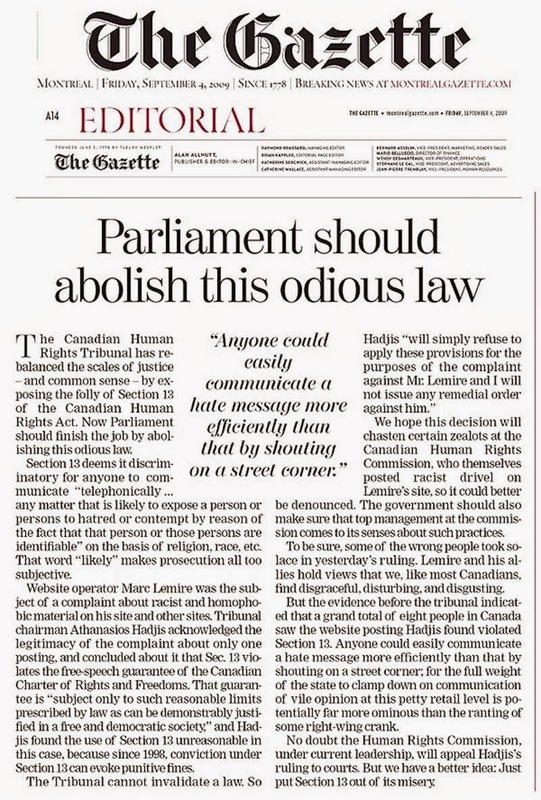 With elimination of Section 13, producing and disseminating hate speech continues to be a Criminal Code violation but police and the courts will adjudicate rather than human rights tribunals. Storseth drafted his bill in 2011 and enjoyed support from the highest levels in cabinet. "Our government believes Section 13 is not an appropriate or effective means for combating hate propaganda," Justice Minister Rob Nicholson said in late 2011. "We believe the Criminal Code is the best vehicle to prosecute these crimes." 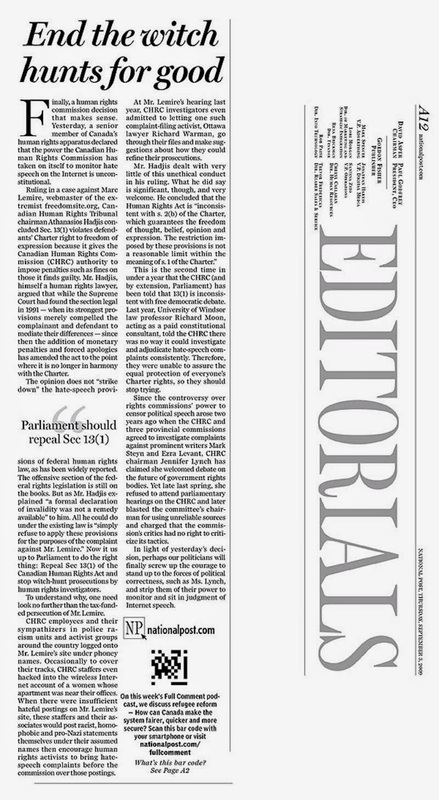 Last summer, Storseth's bill cleared the House of Commons in a free vote and, now that it's through the Senate, it will get royal assent and Section 13 should soon disappear. As I write this I am still only being updated by text message on the proceedings in the Senate chamber but I am told Bill C-304 has passed third reading and will receive Royal Assent tonight making it law. 2. Section 13 of the Act is repealed. To put it bluntly, the means you can’t take someone through the federal human rights apparatus over hurt feelings via a blog post or a Facebook comment. Now the bill is passed and will become law but like many acts of Parliament it will not come into force for a year. 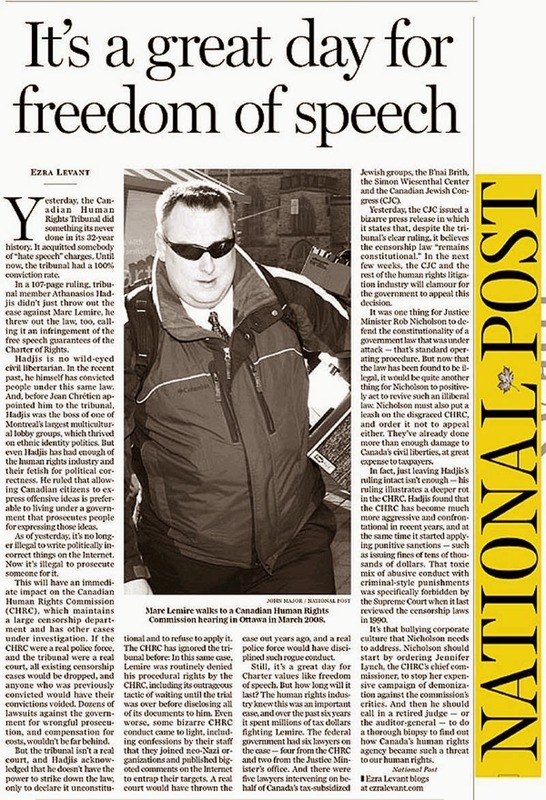 Still after a long hard battle to restore free speech in Canada, this is a victory. Here is the section of the act as it now stands, soon to be just a memory. News is just breaking across Twitter that the Senate of Canada has finally passed third-reading on Bill C-304, which is an Act to repeal the censorship provision – Section 13 of the Canadian "Human Rights" Act. Michelle Rempel, MP ‏@MichelleRempel : Congrats to @BrianStorsethMP, whose PMB (C-304), I have on good authority just passed @senateca on third reading. More information to come tonight as information is posted to the Senate's website. This is a great day for Freedom! 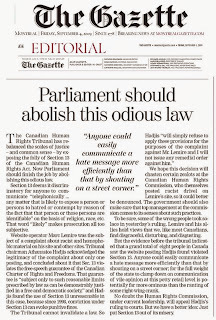 Last week, the Senate of Canada passed Bill C-304 on Second Reading and sent the bill onto the Standing Senate Committee on Human Rights. Bill C-304 is a private members bill which will repeal the ravenous censorship of Section 13, of the Canadian “Human Rights” Act. Section 13 makes it an offence to "likely" "expose" privileged groups to "hatred and/or contempt." There are NO defences under Section 13! Even truth and intent are considered irrelevant to a finding of discrimination. The law was enacted in 1977 in order to silence a man named John Ross Taylor for messages he recorded onto his telephone answering machine. In the intervening 32 years, not a single person who has been hauled up on Section 13 charges has ever been acquitted - a 100% conviction rate. Section 13 has been used and abused since its inception. On June 25, 2013, Brian Storseth appeared before the Standing Senate Committee on Human Rights to defend Bill C-304, his private members bill to repeal Section 13. 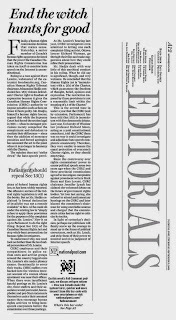 Mr. Storseth made some great points even through the onslaught by Liberal committee members who were desperate to try to claim his bill would only benefit “white supremacists”. 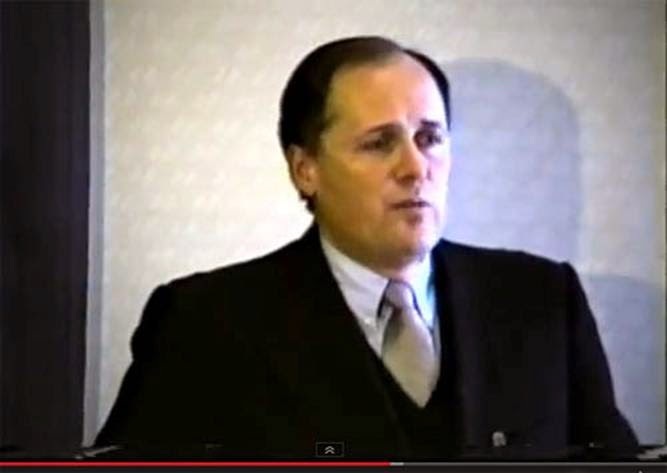 It is a pathetic Liberal move to link the repeal of Section 13 with “white supremacy”, but what can you expect from a party, stuck in the 1980’s, that is totally out of touch with Canadians. The Liberal hacks tried the same schtick, when Liberal MP Dr. Keith Martin introduced his motion to repeal Section 13 (M-446) back in 2008. Of course, the “white supremacist” comments were laughable, since Dr. Keith Martin is as far from a “white supremacist” as possible and even describes himself as a “brown guy”. After the review, Bill C-304 will be sent back to the Senate of Canada for a final vote. The June 26, 2013 Standing Senate Committee on Human Rights is being broadcasted on ParlVU starting at 9:00am, and can be watched live at: http://senparlvu.parl.gc.ca/Guide.aspx?viewmode=4&categoryid=-1&currentdate=2013-06-26&eventid=9003&languagecode=12298 The ParlVU webcast is archives online and can be viewed at any time. Let’s hope the Senate can get a move on and pass this law before the summer break. Mainstream media outlets, from Victoria to Halifax, have demanded a repeal of Section 13 and denounced the human rights industry. 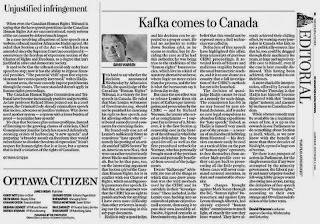 Editorials commonly refer to the Tribunal as a "kangaroo court," and highlight how 'human rights' commissions “threaten our liberty."